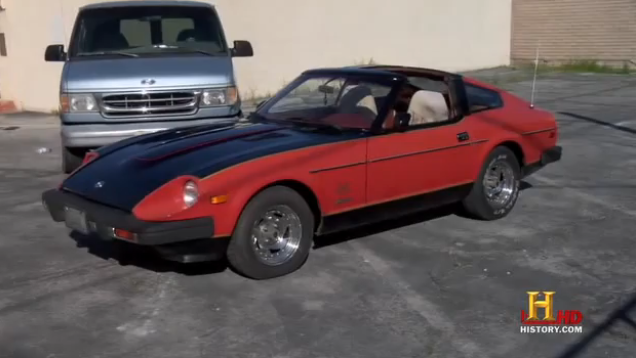 I was watching Pawn Stars not too long ago on the History Channel and was surprised to see a 280ZX being brought in for sale. It was a 1980 10th Anniversary Edition 280ZX, one of only 500 Red and Black ones that were made. The paint seemed to be in pretty rough condition since the owner had painted it himself and the motor had some issues. What was funny was the owner initially wanted $28,000 for it saying it could be sold for $60,000 or more. I haven’t done a lot of pricing on these particular models but I doubt they go for that much unless they have been stored since the day the rolled off of the showroom floor. They ended up not buying it but it was nice to see a 280ZX on the tube for the first time since who knows when, even if it wasn’t pristine, not many are. 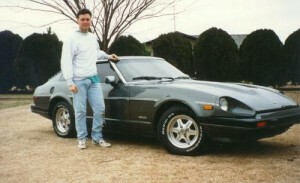 I sold my first Z car in 1990 if I remember correctly. After that I went through a phase in my personal and college life which is a story meant for another blog so we’ll skip to 1993. I had started to get my life back on track and after a stupid vehicle purchase (198X? Fiat X19) I decided it was time to search for another solid car. The hardships that I briefly mentioned above ended with that Fiat getting repossessed by the bank so I was no longer in a situation where I could get a loan for a car from them. I was still working with my Dad in the roofing business, my older cousin Brent was a partner of my Dad’s in this business and we got along pretty well. My cousin always seemed to have some sort of blind faith in me for which I am forever grateful, he agreed to give me a loan for my next car and so the search was on. 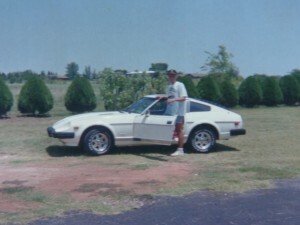 I located a 1983 280ZX in Dallas which was a couple of hours south of my hometown (Pauls Valley, OK). I don’t recall how it was that I found this car but in 1993 there was no craigslist, ebay or cars.com to help with nationwide searches so it must have been in the Dallas Morning News classifieds. Brent and I headed off to Dallas on a Saturday morning to check over this car. The car was at a dealer and I remember it was in excellent condition so I knew I wanted it as soon as I saw it, the rest of the talk was between my cousin and the dealer so I don’t recall much else about getting the deal done. I remember taking it on a test drive and Brent telling me to make sure not to rest my clutch foot on the clutch since it will lead to premature clutch wear. I’m sure my Dad had also told me that years before while training to drive a 5 speed in the 1980 Datsun Pickup but for some reason that is one of the things I recall vividly about the purchase of this car. We made the decision to move forward with buying the car so Brent cut them a check and we were on our way. 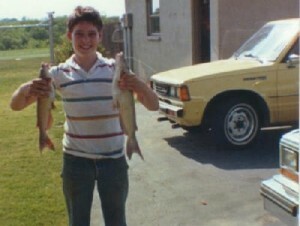 It was the Summer of 1988 and I was 17 years old. I was working during the Spring and Summer with my Dad in the family roofing business so I had saved up a little money and decided that I wanted to buy a car. I had been driving my Dad’s yellow 1980 Datsun King Cab pickup up until that point and really had no complaints about the reliability and efficiency this truck possessed. I was 17 years old however, so this meant the “yellow Ferrari”, as we lovingly called it, wasn’t quite stylish enough for the persona that I needed to create (not to mention I had been a sports car buff ever since I had seen The Cannonball Run in the early 80s). My Dad agreed to help me find a car and co-sign on a loan if needed so the search was on. I can’t recall exactly why I started focusing on Z cars during my search but it probably had something to do with the fact that we had a Datsun already and it was hard to find a better car for the money than a 280Z or ZX. We located a 280ZX (in the Bargain Post) a little more than an hour away so we scheduled a trip on a Saturday to go check it out. When we arrived the owner met us with it in a grocery store parking lot and we checked it out, we knew right away that it had been misrepresented as being in “Excellent” condition but continued to give it the benefit of the doubt. The interior was pretty ragged out and it had this horrendous pin striping and probably a few other things that I don’t recall. We decided to pass on this car and felt that we had wasted a trip to “The City”. As we were leaving we noticed a white 280ZX in a parking lot next to the grocery store. To our surprise it had a For Sale sign in the window so we proceeded to call the number listed. The owner was at work a block or two away and couldn’t leave to meet us but he had his wife (in her bath robe!) come and show it to us. We both knew this was the one, it was in excellent condition and there had to be some fate at play for us to find it the way that we did. It was a little more than I had planned on spending but if paying that little more meant that I got a car in that condition vs. the other one we saw then it was a no-brainer for me. We decided to make the purchase and went to pay the owner. I cut him a check from my checking account (backed by a loan from the bank) and we were on our way home. I will never forget that long drive back home in the first car that was my very own. I ended up becoming desperate for cash a few years later while in college and sold the car, a move I’ve mentally kicked myself for more than once since then but life goes on. I now live in the town where we purchased the car and I drive past that old grocery store parking lot quite a bit. I’m always reminded of that fateful day when I became a car owner for the first time and a Z car fanatic.